QuickStep is a brand name synonymous with quality, durability and design. They now offer two different types of Resilient flooring options: Flexible Luxury Vinyl Floors (LVF - EnduraTEK) and Rigid Core Luxury Vinyl (EnduraTEK Ultra). 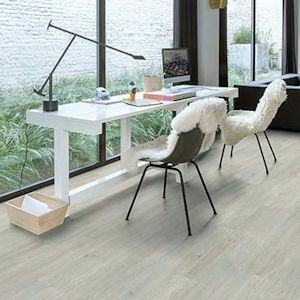 Both great options for virtually any room of your home, these vinyl planks and tiles are the perfect way to update your home with amazing style and durability without breaking the bank. The 22 mil commercial wear layer with ResistAll provides superior wear resistance and seals the surface to resist soil, scuffs, micro-scratches, stains and fading. It also makes Quick-Step LVF and Rigid Core Vinyl incredibly easy to clean and maintain. Quick-Step EnduraTEK and EnduraTEK Ultra are faster and easier to install than typical vinyl products because it features the patented Uniclic MultiFit locking system and no tools are needed. Click planks together horizontally, angle and click down, or drop down click together. This makes Quick-Step LVF and Rigid Core planks easier to install in tight spaces, like up against walls or under cabinet overhangs. Perfect for a DIY installation. These vinyl options click together easily over existing hard surfaces, too -- with no rip up involved, it's the easiest way to update your home in no time at all. Approved for installation over Radiant Heating Systems and are waterproof -- so a great option for bathrooms and kitchens. Rest assured that Quick-Step LVF and Rigid Core Vinyl is FloorScore certified and meets the indoor air quality emissions criteria of LEED and other healthy building programs. Planks are created using 100% virgin vinyl, ensuring harmful chemicals, heavy metals and other potentially hazardous contents are not recycled into the flooring. Ortho-phthalate free. EnduraTEK Ultra from QuickStep is a Resilient waterproof flooring option that is truly built to perform. Rigid core vinyl products are the best of the best. The 22mil wear layer resists micro-scratches, stains, heat and sunlight. The Multifit locking system from Uniclic is the easiest to install and locks tight to prevent water damage, warping and gapping. An attached underlayment pad eliminates an installation step and adds to underfoot comfort once installed. EnduraTEK is a great 4.5mm flexible vinyl plank collection with lots of color options to choose from. Wood plank visuals available as well as tile visuals (Curate). Durable, easy to install and waterproof, EnduraTEK is a great way to update virtually any room of your home. Click lock floating or glue down installation -- you choose. 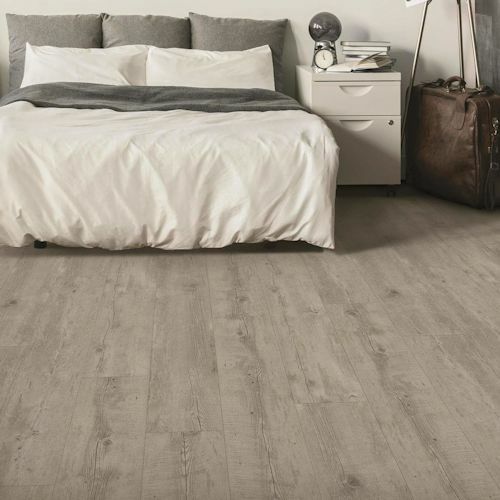 Quick-Step offers EnduraTEK vinyl with a Limited Lifetime Residential Warranty and a 10 Year Limited Commercial Warranty.